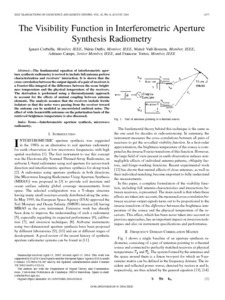 Corbella, I.; Duffo, N.; Vall-llossera, M.; Camps, A.; Torres, F.
The fundamental equation of interferometric aperture synthesis radiometry is revised to include full antenna pattern characterization and receivers' interaction. It is shown that the cross correlation between the output signals of a pair of receivers is a Fourier-like integral of the difference between the scene brightness temperature and the physical temperature of the receivers. The derivation is performed using a thermodynamic approach to account for the effects of mutual coupling between antenna elements. The analysis assumes that the receivers include ferrite isolators so that the noise wave passing from the receiver toward the antenna can be modeled as uncorrelated ambient noise. The effect of wide beamwidth antennas on the polarization basis of the retrieved brightness temperature is also discussed. Corbella, I., Duffo, N., Vall-llossera, M., Camps, A., Torres, F. The visibility function in interferometric aperture synthesis radiometry. "IEEE transactions on geoscience and remote sensing", Agost 2004, vol. 42, núm. 8, p. 1677-1682.